– Send a photo and we will get right back to you! or click to Call 416-515-0007 today! Get in touch today for an affordable Tattoo Removal! Our Toronto Tattoo Removal rates are the best you will find. There is a significant discount for removal of multiple tattoos and outlines. There is also an additional drop in price once most of the tattoo has faded. Patients who have visited other tattoo removal clinics are always surprised how reasonable we are! We built our business on word of mouth from happy patients and many of the leading tattoo artists in town. So we offer the best prices and the best results – with the added advantage of a Licensed Physician operating the laser! We’ve all heard tales of the tattoos that people later learn to regret, but you never thought it would happen to you! When it comes time to remove your ex-boyfriend or ex-girlfriend’s name from your body, or that tattoo you got after a long night of heavy drinking, there’s only one Toronto laser tattoo removal service you can trust: Baywood Laser Clinic. Why trust your laser tattoo removal to a non-medical spa, or a clinic where you never even meet a physician? The removal of tattoos through the use of lasers is a medical procedure, and should be treated as such – and never left to amateurs. At the Baywood Clinic, you’ll only ever have to deal with Board Certified laser doctors, who will provide your consultation, and personally perform all your laser treatments, including any topical anesthetic you may need. 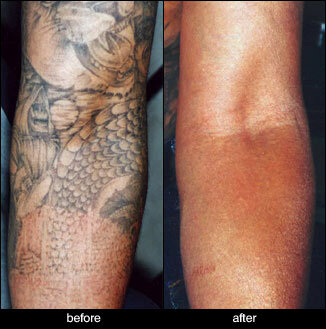 The best part is, we only use lasersspecifically designed to remove tattoos, and top of the line equipment at that! We use three separate state-of-the-art laser systems: Q-Switched, Alexandrite, and ND-Yag Lasers; which make use of 5 different wavelengths, for black, dark and light blue, green, red, and other colors, to aid in effectively erasing even the darkest, most stubborn tattoos. With over 100 tattoos removed each month at Baywood Laser Clinic, you can rest assured knowing you’re in the hands of medical professionals. Worried about complications, like Scarring? Many patient are very worried about complications. This is why it is important to visit a medical laser clinic, where you will be treated by a Physician. With over 30,000 tattoo removal treatments our complication rate is near zero, and we have never had a patient scar. But complications can occur – we often see patients treated elsewhere who have scarred, and we do our best to correct these, at no charge. As Physicians we can treat complications with medication, or with other lasers. So before you choose your clinic, remember that at Baywood, we won’t tell you to go see your family doctor if a problem occurs – we are Doctors, and we know how to take care of your skin. There is sometimes redness, mild swelling or tenderness, crusting, a sunburnt sensation, or itching right after laser treatment. The doctors will discuss your treatment program with you at the time of your consultation and be happy to tell you more about what you can expect from laser tattoo removal. If you experience anything different than what is discussed with you following your treatment, report back to your physician for a follow-up visit. Our Q-Switched Alexandrite and ND-Yag Laser emits powerful beams of light, designed to be absorbed specifically by the particles of ink in the skin. Certain colors of light are absorbed by specific colors of the tattoo ink. The light fragments the ink particles and your body absorbs these particles naturally. The color fades over a few weeks. Are there other ways of removing my tattoo? Laser tattoo removal is the safest, quickest treatment available, and the least likely to damage your skin. Other treatment options are surgical excision, chemical peel and traditional dermabrasion. These are rarely used today as they have a high likelihood of scarring the skin. Some patients have tried the various “liquid tattoo removers” available online. The results are not very promising and are often as expensive or more expensive than laser, with much higher risks for complication, since these products are basically acids. What are Tattoo Removal treatments like? First, the tattoo is cleansed and photographed. Emitting laser or pulsed light, the laser hand piece glides over the surface of the tattoo. The size and color of the tattoo determine the length of treatment time. A tattoo the size of a quarter would take approximately 3-5 minutes to treat. Some patients request a topical anesthetic cream that when applied prior to a treatment, can minimize the stinging effect of the laser or intense light. Many patients tolerate the removal procedure without topical anesthetic and report the treatment as feeling similar to numerous rubber band snaps. An ointment is applied following the treatment to keep the area moist and then it is covered with a protective dressing. Generally, the gauze or protective dressing can be removed after about 3 days, by then the skin has healed enough. It is not necessary to put any sort of cream or ointment on the skin, since this can rarely cause allergic reactions. While the gauze is on it is best to wrap in Saran Wrap when you shower or bathe so that the dressing does not get wet, as it is uncomfortable then; this will not affect the healing though. If you have any concerns at any time about your healing process or laser tattoo removal procedure, email us or phone and we will respond ASAP. Send a photo so that the doctor can have a look. Prices for laser tattoo removal start at $100 per session. The vast majority of tattoos fall between $160 and $225 per session. There are no added fees for multiple colors. There is a major discount for multiple tattoos, and for incomplete tattoos and outlines. There is no charge for the consultation with the doctor. Our rates are very reasonable compared to any legitimate laser clinic in Toronto. If you have multiple tattoos that you want removed, there is a discount, just as there is for an outline that is not filled in. How many tattoo removal treatments are required? The number of treatments that you will need to effectively erase the tattoo depend on its size, color, location and age. During your consultation, the doctor will discuss your treatment plan and answer all of your questions. Be sure to contact us if you experience side effects not described during your consultation. Amateur tattoos require 3-6 sessions on average Professional require 8-12 on average, 6-8 weeks apart (at least). This is true no matter what you have been promised. These are facts that have been established by many studies in medical journals. Every tattoo is different, it all depends on the type of ink, the amount used, the method, the depth of the ink, and your own body. Results vary from patient to patient. After each session the tattoo becomes lighter. Various types of ink are used in tattooing, so the results and the number of treatments vary. Typically, multiple treatments will be required and are scheduled 4 to 8 weeks apart. Amateur tattoos generally require 4-6 treatments, while professional tattoos can take up to 10 treatments or more. Black, dark blue, and red colours respond best. Thinking of Laser Tattoo Removal in Toronto? The Baywood Laser Clinic has been performing tattoo removal since 2001. Our Doctors have vast experience with all types of tattoos. In fact, we have performed over 50,000 treatments! The doctors personally perform all procedures, using the best lasers available. Over the years we have tried many different machines and are constantly trying to provide our patients with the best, quickest, and most cost-effective treatment. Tattoo removal is usually quite tolerable, most compare it to “elastic bands snapping” or like “little sparks”. Or patients say it feels like laser hair removal, if they have tried that procedure. If you require more freezing of the skin, as licensed physicians, we can use prescribed anesthetic if necessary, so you are comfortable. Non-medical places cannot. We often see patients with complications from other places; typically, this happens after their first session, where they tell us they had blistering. Often, we can help reduce their risk of scarring by using other lasers we own, and they continue their tattoo removal treatments with us. Our complication rate is close to zero, and as Physicians we can treat complications with prescription medication or other lasers we own. The most common complications are some temporary lightening (hypopigmentation) or darkening (hyperpigmentation) of the skin. These happen in less than 5% of cases, and almost always resolve on their own or with some medication. The key factor in avoiding any complications is having an experienced person operating the laser, making sure that the energy levels are not set to high and that the pulses are properly placed and at the right speed. Also, that after treatment the patient is given proper instructions on how to care for the tattoo – it is a burn wound, after all. If these precautions are taken the chance of any serious complication like scarring is virtually zero. Regarding individual tattoos, we must see it in person to tell you it’s prospects in terms of sessions and costs. To fade enough for a coverup usually takes 3-4 sessions; to try for complete removal 7-12, but it varies for many reasons. These are averages that have been established in the serious medical literature, no matter what you may be told. we encourage patients research hospital clinics or medical literature to verify what we tell them about laser tattoo removal. Our policy has always been total honesty – as physicians our reputation is our most important asset. Beware of anyone who promises total clearance in a guaranteed number of sessions, we see patients every week who’ve been very disappointed with false claims or were given lowball fees but never-ending treatments. Our priority is to get rid of as much of your tattoo as quickly as possible, within the bounds of safety. We rely mostly on patient and tattoo artist referral for new clients, and so our reputation is our most valuable asset. Many patients voluntarily put their Before and After photos on their social media. 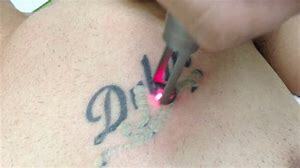 We are very reasonable with tattoo removal rates compared especially to legitimate laser clinics in Toronto. Most tattoos are $125-275 per session! Patients who shop around are always surprised how reasonable we are, since they are often quoted prices two to three times higher. We don’t do “packages”, be very wary of them since the goal is always to sell you a second one! We had a patient who had to get MasterCard to cancel an $1800 package, because the clinic kept postponing his second session. other patients complain that their sessions seemed to drag on forever, and there was always pressuring to upgrade or renew packages. We never pressure patients, and actually prefer if they go home after the consultation and take their time to think about what we have discussed. Often, they might have further questions which we are happy to answer in an e-mail or follow up, free consultation. Deciding to commit to a laser tattoo removal series of treatments is a serious, expensive undertaking. You should feel sure that you have made the right decision, without any pressure and with total confidence in your clinic. We have heard from patients that other places have professional “closers” who get involved in the consultations, offering better deals if they only sign up right away, or call or text them for weeks following their visit with new and better offers and deals. We pride ourselves in our honesty, we do not play games with what is a serious decision, one you should make with all the facts. You can view more information about laser tattoo removal in some of our blog posts. 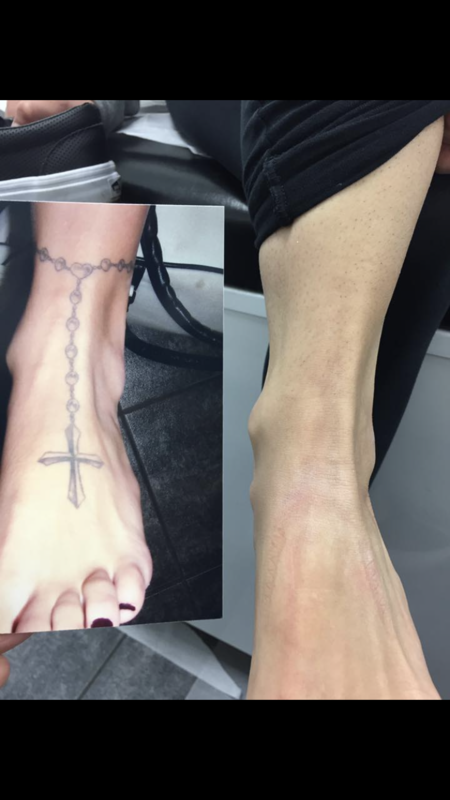 Pico type laser tattoo removal in Toronto? Is it worth it? Patients in Toronto often ask our tattoo removal clinic if pico-type lasers are superior. They hear claims that these can remove tattoos in 5 sessions, or that they work twice as fast as the traditional Q-switched lasers that we use. These lasers came out about 4-5 years ago and cost 3 times what the traditional lasers, the gold-standard, did. We were skeptical, since over 20 years we have seen so many fads in the laser business – companies promising fantastic results that did not materialize after 3-3 years of in the field use. And we were right to wait, rather than to jump in and buy machines that would simply have added tremendous additional costs to our treatment prices. We see patients every month who have spent $600 – 1000 per session with a pico-type laser and are not happy after 5 sessions. We continue their treatment in the $200-350 range, and they are very pleased with their results. Pinto F, Grosse‐Buning S, Karsai S et al. 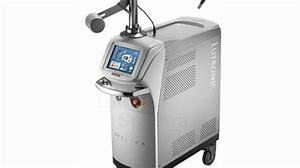 “Nd: YAG (1064‐nm) picosecond laser vs. Nd: YAG (1064‐nm) nanosecond laser in tattoo removal: A randomized controlled single‐blind clinical trial.” Br J Dermatol2017; 176(2): 457–64. This is a legitimate, scientific study, published in one of the world’s leading Dermatology Journals. If a laser has not led to “major progress”, and were “not superior” to the traditional lasers that we use, why would we buy one and raise our prices to you several fold? Our goal is always to provide cost-effective treatment; if a new procedure is going to cost twice as much, shouldn’t work twice as fast, or be significantly superior in some way. We look forward to the day that there is significant improvement tin laser technology, so that we can offer better, safer, faster treatments. But as of today, the traditional Q-Switched lasers are still the gold-standard. 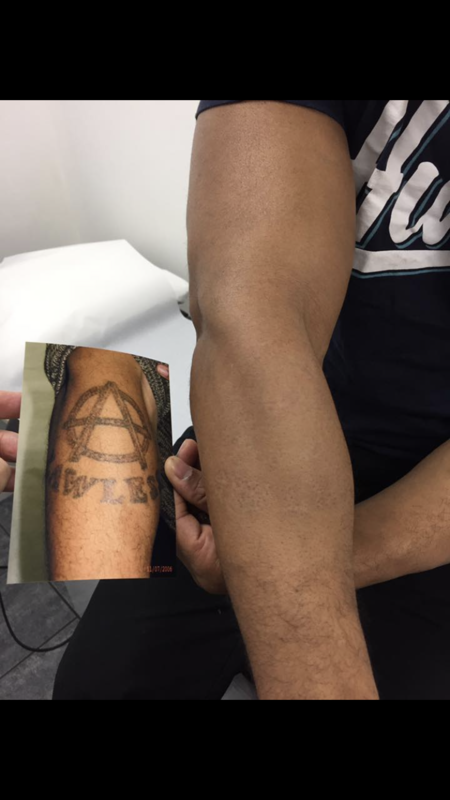 In almost 20 years of performing tattoo removal in Toronto our Doctors have had thousands of success stories. Many patients regret a tattoo almost immediately, we have even had patients come directly from the Tattoo Shop, without even booking an appointment! Usually patients feel they have outgrown the tattoo – an image or script they related to in their teens or twenties no longer has any meaning for them. Or it might be the name of an ex-partner they want to remove. Some patients come before an important event – removing a visible tattoo before a wedding is a common reason. Or before an important job interview or possible promotion. Quite a few patients visit us first for another treatment, Botox for example. And, over time, they start to think of getting rid of that old, faded tattoo as well. In many cases, the tattoo just doesn’t fit their lifestyle anymore, a tattoo of a band they loved when they were 16 might be reminder of awful that music sounds to them today. Or the name of a long-lost romance form 20 years ago no longer sits well with their new partner or spouse. Surveys have shown that as many as 85% of Canadians regret getting their tattoos within 10 years, and many are thinking of laser tattoo removal! Even though tattoos have become quite common, certain occupations still frown on visible tattoos, some restaurants, the financial industry, schools and so on. We often joke with our patients that we should put up two brass plaques saying, “What was I thinking?” and “I should have listened to my mother”, since at some point in their treatment almost every patient says a version of one of these two statements. But the good news is, as we often say, if getting a tattoo was the “worst decision” in your life, as many say, you are doing fine. It is almost always possible to fade a tattoo to the point it is not visible, or at the least to where it easily coverable with light makeup. So, do not despair, there are millions of individuals world-wide with tattoos, who, like you, regret them. We will do our very best to make you laser tattoo removal experience in Toronto a safe and effective one.